You can purchase an Insight Stones personal analysis to assist you in interpreting the messages that come through the board! This personal e-mail analysis will provide you with stone interpretations on a question that is important to you. You can e-mail a picture of the stone layout on the board or a list of the stones and where they landed along with the question. Within 24 hours, you'll have a detailed interpretation containing amazing insights about what you need to know regarding the topic you asked about. 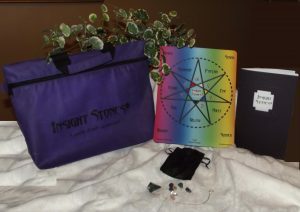 This great deal starts with the complete Insight Stones® kit! Tap into ancient wisdom any time you want with Insight Stones®! 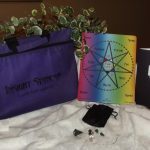 Kit includes 7 vibrant gemstones with velvet pouch, 1 game board (8.5″x11″), and Insight Stones interpretation guidebook (20 pp), all in a vinyl storage pouch with Velcro closure. Ages 15 and up. Not suitable for young children – small parts could create choking hazard.